A slew worm drive system is a compactly constructed unit which consists of a MJM slewing ring, base plate and worm. 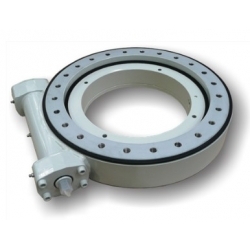 This unit brings the advantages of a slewing ring and a worm into one unit. It is suitable for slow rotation equipment with a continuous or cyclical movement capable of handling combined loads. The product is of a series nature and therefore it has standard dimensions for coupling an electric or hydraulic motor as well as coupling a whole system to equipment. 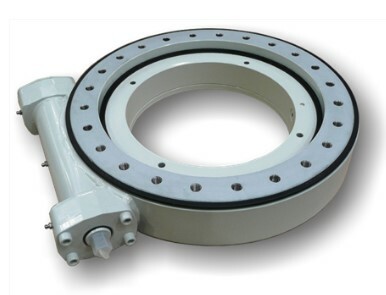 Due to its compactness, high rigidity and other mentioned advantages, a worm drive system is used in varying equipment such as mobile assembly platforms, hydraulic loading cranes on haulage vehicles, small marine cranes, extendable rotating ladders, in wheel units of large portal transporters of marine containers. easy and fluent method of starting and stopping.